Efficiency in general terms, describes the extent to which time, effort or cost is well used for the intended task or purpose. So, a more efficient Fire Rescue Athlete will be able to do more work with less physical effort. This is especially important since most of our “more intense” work as Fire Rescue Athletes comes when breathing air via an SCBA. The winter months can be a challenging time to keep your weight and body fat in “check.” So, to help you stay lean and perform better on (and off) the fireground, I came up with some easy tips. Here are 10 (actually 11) great tips to help you get stronger and leaner in the next couple of weeks. These tips can help you stay on track through these challenging months of winter. Take a look. 2. Follow a consistent and effective EXERCISE program! Yes, you can lose weight and fat just by changing your eating habits. Fire Rescue Athletes need to be ready for any situation, a well planned fitness program is essential. But, very few fitness programs prepare Fire Rescue Athletes to be “fit for duty” and help decimate fat…..until now. 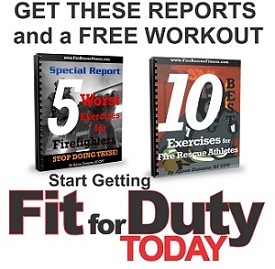 Click HERE to Check out the FRF Rapid Fat Loss Workout for Firefighters. Time to get “Fit for Duty,” I hope these tips help. Please comment, share and like your thoughts.